Sterling silver, real Coral, Jet, Abalone Shell, and Mother Of Pearl. 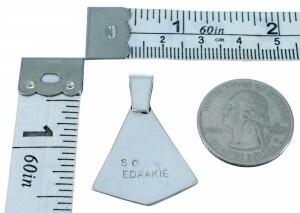 Pendant measures approximately 1-3/8" long (including bail) and 1" at widest point. This lovely pendant will definitely attract plenty of attention! This piece of Native American jewelry is Zuni hand crafted by artist S.C. Edaakie, out of genuine Sterling silver and real Multicolor inlay. The inlay consists of: Coral, Jet, Abalone Shell, and Mother Of Pearl. 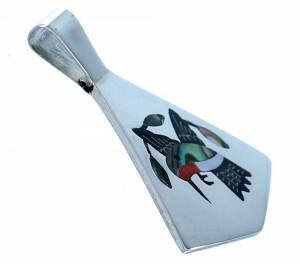 The inlay is carefully set while creating a lovely Hummingbird design for a marvelous finish. 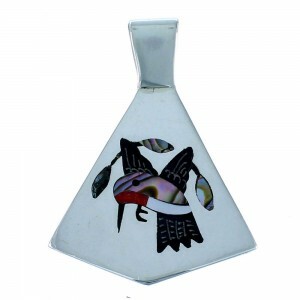 Pendant is hallmarked by the artist.